Thanks to Mr. Briney you have come to Dewford Town, where you'll be competing for your second badge. First, there are some things to take care of. Go into the house next to the Pokemon Center, and talk to the guy sitting at the table. He'll give you a Silk Scarf. The Fisherman next to the gym will give you an Old Rod. 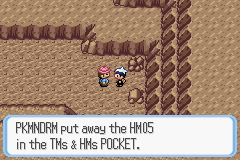 Fishing in Ruby/Sapphire/Emerald works a bit differently than it used to. Before you get a bite, you can press "A" to quit fishing. However, when you do get a bite and you press "A", there's a chance the Pokemon might get away. If not, you can battle it for a capture. Heal your Pokemon if necessary, and get into the gym. Once you enter the gym, you'll notice everything is dark except for the circle of light around you. The circle gets larger after every trainer that you defeat. It is quite easy to get through this. Just look around, battle a few trainers, and you'll be near the gym leader soon enough. The gym leader, Brawly, has only two Pokemon. One of them is a lv. 17 Machop, and the other is a lv. 18 Makuhita. In Emerald, he has a lv. 16 Machop, a lv. 16 Meditite, and a lv. 19 Makuhita. Makuhita is quite weird looking, as it looks like a cross between a Pikachu and an Electabuzz. It is harder to beat than Machop and Meditite. Brawly give you TM08 - Bulk Up and a Knuckle Badge for beating him. The badge allows Pokemon up to lv. 30 to obey you. Remember to heal your Pokemon, and leave the town by heading north on Route 106. On Route 106, you'll battle two Fisherman. At the end of the route is a cave. Go in there, talk to the guy in front of you, and he'll give you HM05 - Flash. Teach it to one of your Pokemon, and go on into the cave. Keep on going westward until you reach the stairs. You must have a Pokemon that knows Flash in order to get through here without any trouble. There is a part of this cave with slippery steps, so you won't be able to go up the steps. 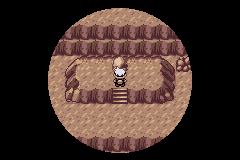 The screen shot to the left shows a hidden Everstone in that rock. It'll be a long time until you really get somewhere. At the end of the cave is Steven. Talk to him, and he'll give you TM47 - Steel Wing. Now you can leave the cave and get back to Dewford Town. Talk to Mr. Briney again to get out of the town. Choose the option in the middle, labled "Slateport". He will once again take you on a boat ride. The boat ride will take you directly to Route 109, but if you surf there, you'll discover better things. If you chose to surf to land on Route 109 (which you cannot do at the moment), you'll find an Abandoned Ship in the middle of Route 108. 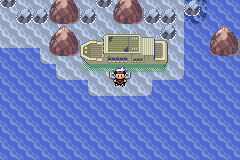 This Abandoned Ship not only has trainers, but also items. Look around, and you'll find: Dive Ball, Revive, Harbor Mail. You'll also find a Storage Key. To use the Storage Key, go to the area where the Tuber and Sailor are standing. Put the key in the door above the Sailor, and the door will open. Inside is TM31 - Brick Break. Now you can go on east towards land. Finally, you'll reach Route 109. Once you get off, talk to the girl who is in the sand with the boy. She'll give you Soft Sand. 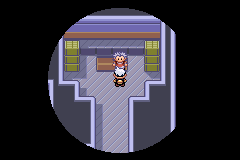 Go into the Seashore House, battle all three trainers, and talk to the man at the very top of the screen. He'll give you six Soda Pops for battling. Battle more trainers to have fun and gain experience, and soon, you'll arrive at Slateport City.